Hulu’s “Into the Dark” is off to a strong start. The series, co-produced by Blumhouse, features brand new feature film every single month for an entire year with wach episode is holiday-themed, with the first two tackling Halloween and Thanksgiving. 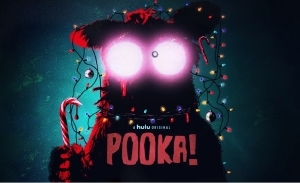 In Nacho Vigalondo's (Open Windows, Time Crimes) POOKA!, a struggling actor gets a holiday season job as a Christmas character in a plush suit to promote the hottest toy of the year, “Pooka.” At first, it’s a fun and friendly distraction, but he slowly develops two personalities–one when he’s in the suit, and one that’s outside it–as Pooka slowly starts to take possession of him. It stars Nyasha Hatendi, Latarsha Rose, Jon Daly, Dale Dickey, Jonny Berryman, and Diane Sellers. Check out the trailer below and watch on Hulu now. Follow Christopher Webster on Twitter.